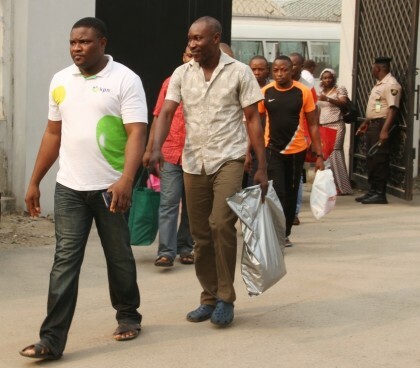 The Economic and Financial Crimes Commission, EFCC, today arraigned 12 persons, two companies and a vessel, MV PSV DEBY before Justice Muhammad B. Idris of the Federal High Court, Lagos on a four count charge bordering on conspiracy, forgery and illegal dealing in petroleum products. MV PSV DEBY and its crew members – Christopher Okorie, John U Mbah, Tammy Bami, Osi Prince, Chukwuji Festus, Kabiru Adeyemo, Ayannubi Moses, Sopuruchukwu Chukwudi, Obinna Ebu, Abdullahi Oyelade, Charles Ubey and Achia Vincent- were intercepted by Nigerian Navy Ship Beecroft patrol boat on the 3rd of September, 2015 on suspicion of illegal dealing in petroleum products. Further investigation revealed that the vessel was carrying thousands of litres of suspected illegally refined automotive gas oil, AGO. “That you Christopher Okorie, Phonic Marines Services Limited, MV PSV DEBY, John U. Mbah, Banquet Chambers Nigeria Limited, Prince Idowu Ilara (at large), Tammy Bami, Osi Prince, Chukwuji Festus, Kabiru Adeyemo, Ayannubi Moses, Sopuruchukwu Chukwudi, Obinna Ebu, Abdullahi Oyelade, Charles Ubey and Achia Vincent between July and September 2015, at Lagos within the jurisdiction of this Honourable court, did conspire among yourselves to commit felony to wit; dealing in petroleum products without lawful authority and thereby committed an offence contrary to Section 3(6) of the Miscellaneous Offences Act Cap M17, law of the Federation of Nigeria 2014 and punishable under Section 1(17) (a) of the same Act. “That you Christopher Okorie, Phonic Marines Services Limited, MV PSV DEBY, John U. Mbah, Banquet Chambers Nigeria Limited, Prince Idowu Ilara (at large), Tammy Bami, Osi Prince, Chukwuji Festus, Kabiru Adeyemo, Ayannubi Moses, Sopuruchukwu Chukwudi, Obinna Ebu, Abdullahi Oyelade, Charles Ubey and Achia Vincent between August and September, 2015 at Lagos within the jurisdiction of this Honourable court did without lawful authority store 600,000 litres of Petroleum Product (Automotive Gas and Oil) in MV PSV DEBY and thereby committed an offence contrary to and punishable under Section 1(17) (b) of the Miscellaneous Offences Act Cap M17, law of the Federation of Nigeria, 2004”. In view of the plea of the accused persons, the prosecution counsel, M. F. Owebe prayed the court for a trial date and to remand the accused persons in prison custody. However, the defence counsel asked for a short adjournment for hearing of the bail application. Justice Idris ordered that the accused persons be remanded in Ikoyi prison and adjourned the case to Tuesday January 26, 2015 for hearing of the bail application.